The developing babies will drink their own pee in the uterus. Your baby’s life in the womb may be safe and warm, but the developing babies will drink their own pee in the uterus. A fetus’s kidneys kick into action as early as week 11 of development. Although the amniotic fluid is mostly made up of a mother’s body fluids in the earliest days of pregnancy, it steadily becomes more and more baby pee. By the end of your pregnancy, the amniotic fluid contains more pee than a water park at the height of summer. Around week 11 of development, another developmental moment occurs. The membrane blocking your baby’s mouth breaks down. Basically, your baby can start swallowing around the same time your baby starts peeing. The urine-fluid is being filtered through your baby at a pretty rapid rate, for want of a better term, and this process is all just part of life inside the amniotic sac. And if you aren’t grossed out enough already, remember that the amniotic fluid also contains a fair amount of your baby’s dead skin cells, which have no where else to go when baby sheds them in the womb. Even though its contents are kind of gross, the importance of the amniotic fluid is impossible to overstate. The amniotic fluid cushions your baby, maintains a steady temperature in the womb, and protects the umbilical cord from damage. Plus, swallowing the amniotic fluid helps your baby’s digestive system develop and strengthen. There’s a purpose for all of this developmental growth, even if it sounds downright nasty — can you imagine swimming in a tub that is mostly your own pee, some other types of fluids, and a few teaspoons of dead skin cells? Oh, and then drinking it? I mean, most people wouldn’t take a swig of pee and skin cells if you paid them, but infants aren’t as picky. OK, if infants basically live in pee up until their birth, what about the other stuff? 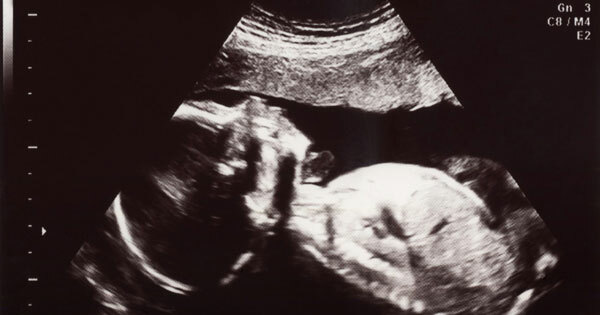 You can rest easy, because your baby is very unlikely to go number two in the womb. Instead, developing fetuses tend to hold this first poop, known as meconium, until a few hours after birth. As with everything related to birth, though, there are some exceptions. In some cases, the infant can inhale this meconium in the womb in a condition known as meconium aspiration, as explained by Kids Health. The sticky substance can potentially block the baby’s airways and lead to potentially serious breathing problems. Thankfully, serious complications associated with meconium aspiration are relatively rare, and your doctor will be on the lookout for this possibility. But knowing about meconium aspiration provides some perspective. With that possibility in mind, the thought of swallowing pee isn’t so terrible, right? Article have been lightly edited for length/clarity.